Beagles have been depicted in popular culture since Elizabethan times in literature and paintings, and more recently in film, television and comic books. Snoopy of the comic strip Peanuts has been promoted as "the world's most famous beagle". Dogs of similar size and purpose to the modern Beagle can be traced in Ancient Greece back to around the 5th century BC. Xenophon, born around 433 BC, in his Treatise on Hunting or Cynegeticus refers to a hound that hunted hares by scent and was followed on foot. Small hounds are mentioned in the Forest Laws of Canute which exempted them from the ordinance which commanded that all dogs capable of running down a stag should have one foot mutilated If genuine, these laws would confirm that beagle-type dogs were present in England before 1016, but it is likely the laws were written in the Middle Ages to give a sense of antiquity and tradition to Forest Law. In the 11th century, William the Conqueror brought the Talbot hound to Britain. The Talbot was a predominantly white, slow, deep-throated, scent hound derived from the St. Hubert Hound which had been developed in the 8th century. At some point the English Talbots were crossed with Greyhounds to give them an extra turn of speed. Long extinct, the Talbot strain probably gave rise to the Southern Hound which, in turn, is thought to be an ancestor of the modern day Beagle. This image from the turn of the 19th century shows a dog with a heavier body and lacking the refined features of later strains. Reverend Phillip Honeywood established a Beagle pack in Essex in the 1830s and it is believed that this pack formed the basis for the modern Beagle breed. Although details of the pack's lineage are not recorded it is thought that North Country Beagles and Southern Hounds were strongly represented; William Youatt suspected that Harriers formed a good majority of the Beagle's bloodline, but the origin of the Harrier is itself obscure. Honeywood's Beagles were small, standing at about 10 inches (25 cm) at the shoulder, and pure white according to John Mills (writing in The Sportsman's Library in 1845). Prince Albert and Lord Winterton also had Beagle packs around this time, and royal favour no doubt led to some revival of interest in the breed, but Honeywood's pack was regarded as the finest of the three. Early images of the Beagle (clockwise from top left): 1833, 1835, Stonehenge's Medium (1859, reusing Youtt's 1852 "Beagle" image) and Dwarf Beagle (1859). By 1887 the threat of extinction was on the wane: there were 18 Beagle packs in England. The Beagle Club was formed in 1890 and the first standard drawn up at the same time. The following year the Association of Masters of Harriers and Beagles was formed. Both organisations aimed to further the best interests of the breed, and both were keen to produce a standard type of Beagle. By 1902 the number of packs had risen to 44. Beagles were in the United States by the 1840s at the latest, but the first dogs were imported strictly for hunting and were of variable quality. Since Honeywood had only started breeding in the 1830s, it is unlikely these dogs were representative of the modern breed and the description of them as looking like straight-legged Dachshunds with weak heads has little resemblance to the standard. Serious attempts at establishing a quality bloodline began in the early 1870s when General Richard Rowett from Illinois imported some dogs from England and began breeding. Rowett's Beagles are believed to have formed the models for the first American standard, drawn up by Rowett, L. H. Twadell, and Norman Ellmore in 1887. The Beagle was accepted as a breed by the American Kennel Club (AKC) in 1884. In the 20th century the breed has spread worldwide. On its formation, the Association of Masters of Harriers and Beagles took over the running of a regular show at Peterborough that had started in 1889, and the Beagle Club in the UK held its first show in 1896. The regular showing of the breed led to the development of a uniform type, and the Beagle continued to prove a success up until the outbreak of World War I when all shows were suspended. After the war, the breed was again struggling for survival in the UK: the last of the Pocket Beagles was probably lost during this time, and registrations fell to an all-time low. A few breeders (notably Reynalton Kennels) managed to revive interest in the dog and by World War II, the breed was once again doing well. Registrations dropped again after the end of the war but almost immediately recovered. In 1959 Derawunda Vixen won "Best in Show" at Crufts. 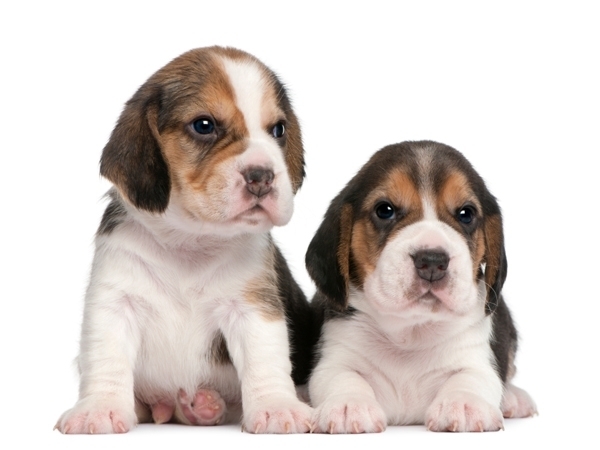 As purebred dogs, Beagles have always been more popular in the United States and Canada than in their native country. The National Beagle Club of America was formed in 1888 and by 1901 a Beagle had won a Best in Show title. As in the UK, activity during World War I was minimal, but the breed showed a much stronger revival in the U.S. when hostilities ceased. In 1928 it won a number of prizes at the Westminster Kennel Club's show and by 1939 a Beagle – Champion Meadowlark Draughtsman – had captured the title of top-winning American-bred dog for the year. On 12 February 2008, a Beagle, K-Run's Park Me In First (Uno), won the Best In Show category at the Westminster Kennel Club show for the first time in the competition's history. In North America they have been consistently in the top-ten most-popular breeds for over 30 years. From 1953 to 1959 the Beagle was ranked No. 1 on the list of the American Kennel Club's registered breeds; in 2005 and 2006 it ranked 5th out of the 155 breeds registered. In the UK they are not quite so popular, placing 28th and 30th in the rankings of registrations with the Kennel Club in 2005 and 2006 respectively.